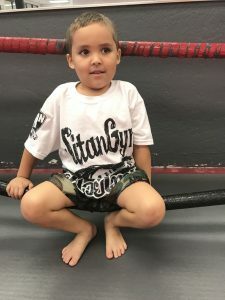 Sitan Gym Arizona has launched a new Special Needs Muay Thai program for high functioning youth on the spectrum (autism, ADHD, delayed development). These classes will take place on Thursdays from 3:00pm-4:00pm. More classes will be added as the classes fill up. Although the Special Needs Muay Thai program is led by Thiago, he does REQUIRE that parent or guardian participate in the class. Sitan Gym Arizona has a long-standing success rate with “at-risk”, “underprivileged” and special needs youth. For 8 years Thiago Azeredo has worked exclusively with Santan Behavioral Health Services, to provide Martial Arts Programs that is geared towards developing, discipline, self-confidence, leadership qualities and goal oriented behaviors to ensure the success of these kids in the real world. Thiago Azeredo and his staff have years of experience with special needs youth. Thiago even works closely with his own son who was diagnosed with autism at the age of 2 in the Special Needs Muay Thai. Octavian Azeredo: Thiago’s son was diagnosed with Autism when he was 2 years old. He has been training Muay Thai since he was 5.